You may purchase most of these items from your local craft, paper, or rubber stamp store or from those we have listed below as sources. 8. 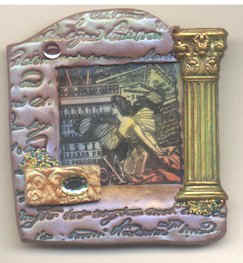 A large filigree backing also from Fancifuls Inc. Roll the Ecru Sculpey out into a thin slab with the rolling pin or pasta machine so it is approximately 1/8 inch thick and 3 to 5 inches square. With the soft bristle brush, apply Pearlex Powder of your choice to the slab of Sculpey, then rub it into the Sculpey lightly with your finger. Ink your stamp with the " Crafters " Stamp Pad color ff your choice. Stamp onto the Sculpey, being careful to apply even pressure over the whole stamp. Trim clay with Ex-Acto knife to desired shape. Texture designs on The Sculpey may also be acheived by pressing a large Filigree piece onto the slab, and then carefully removing it. Decide what charms you want to use, and press lightly into Sculpey clay to make an impression, carefully remove them and set them aside for aater. Remove the Sculpey from the oven and allow to cool. If desired, antique and / or paint your charms. With the E6000 adhesive, glue your Sculpey to the large filigree backing piece. 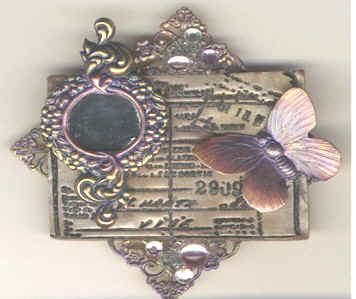 (if any of it shows around the edges, antique or paint it to coordinate with the Sculpey slab). Glue the charms to the Sculpey where you made the impressions. Glue on clusters of " Beedz " if desired. If you want to apply glitter, apply a small amount ff water base varnish where you want the glitter to stick. Sprinkle the glitter onto the wet varnish and allow to dry. Brush off any glitter not stuck to the varnish. Put (2) two coats of water base varnish over the entire piece ( Sculpey, charms, Beedz, & glitter ) and allow it to dry. Glue on Jewels if desired. Glue a pin back on. Now you've created your own unique pin to dazzle your friends who will probably beg you to make one for them! Sand plastic with fine sandpaper until there are no more shiny spots. With your Exacto knife, scrape some of the pastel chalks ( Several different collors ) onto a scrap of paper. Pick up some chalk dust with your finger & rub it onto the plastic, blending different areas of color together. ( do this lightly, as color intensifies when the Shrink Plastic shrinks ). Stamp with your crafters ink. Shrink the plastic according to instructions on the package.